A while back I was told by someone with some animal behavior training, that “novelty” is something coyotes stay away from. That novelty and smelly human socks were things coyotes avoided and therefore could be used to drive coyotes away. Actually, the opposite seems to be true. I’ve seen coyotes absolutely delight in smelly old human shoes, their socks, coats and hats: they tend to actually be attracted to these things and to anything novel, including balloons waving in the wind, and even large objects like huge dirt piles and tractors — and no matter that the size and configuration of the huge dirt piles changed daily over a five day period, that the tractors were never in the same places, that the huge log piles grew and then slowly disappeared over a five day period, the coyotes returned for their play there day after day. The morning that I took these photos, a huge, deep hole had been dug into the very level ground. It went down as deep as the piled up dirt was high. You can’t really tell from my photo, but the pit is very deep. My fear when I saw the hole was that if I, or a coyote from the family which roams the area were to slide in, there would be no getting out without help. Luckily, everyone was sure-footed and no one fell in! So, after the tractors had done their work in the morning, I arrived at the huge pit and dirt pile. 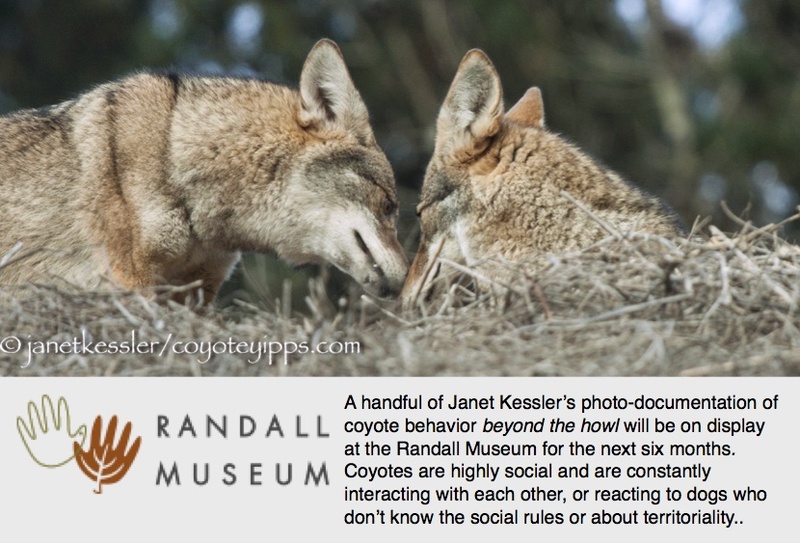 It was rendezvous time, which is the evening get-together when coyotes meet-up for play, grooming, re-confirming their family positions and eventually trekking. At the allotted time — and I must say that I don’t know how each coyote knows to appear at about the same time because they emerge from different areas of the park — possibly they’re just waiting and watching — they raced excitedly and playfully towards each other with greetings. Their greetings were full of fun, as usual, and then they headed straight over to the three huge tractors and dirt pile that hadn’t been there the day before, where they exploded in play: running around as though these things had been placed there specifically for their enjoyment! They ran and chased each other along the top ridge of the dirt, and up and down, they explored the tractors, they explored and clambered all over the high wood-pile. And they smiled at all their fun. They did not avoid anything new, and it all was new. Enjoy the fun! This evening’s observation pulled at my heartstrings. At first, I could only locate one coyote of a family I’ve been observing — the yearling female who recently is being bashed on a daily basis by her mother. She was alone and, unusually, she kept her eye on me and kept looking into the distance past me. I distanced myself but kept her in sight. After about an hour, she stopped poking around and looking around aimlessly, and lay down on the lawn, sphinx-style. Right about then, I noticed that all the other coyotes of her family, four of them, had appeared together in the distance. She, of course, would have noticed them too, her eyes being that much better than any human’s. And now she looked in their direction. But she stayed where she was, lying down, instead of running happily with tail waving behind her to go say hello for their evening rendezvous. I decided to walk towards the rest of the family — they were probably about 800 yards or so away. As I walked, I looked back. The yearling female had not budged. I continued on towards the family. They had greeted each other and now Mom was pacing back and forth probably looking for the female; Dad was relaxing on a knoll; and the two other youngsters were playing: wresting, chase, tug of war — all normal and happy evening rendezvous activities — except the yearling female was not included. After a minute of watching, I turned around and marched back. The yearling female had not moved. She was watching her family have a grand time, and she was not part of it. I had now returned to within 70 feet of the yearling female. Sirens then sounded and she sat up. In the distance, the entire family could be heard yipping and howling along with the sirens — but not this one. She kept quiet. She remained seated, watched and listened from the distance. And then she lay down again, focusing on where the yipping sounds had come from. It was totally dark now and my camera just couldn’t cope with no light, so I decided to leave. It’s the holiday season: it made me think of “they never let poor Rudolph, join in any reindeer games.” To be sure, there’s been affection between twin brother and this gal and even dad and her. I’ll post some photos of these soon. As I walked away, I noticed, finally, that the family, beginning their nightly trekking, had come in her direction, and she had headed towards them. She had moved about 50 feet from where she had been. Dad is her perennial comforter, and with him there, she must have felt safe enough to approach him. As I walked down the hill and away, these two were right on the horizon against the almost black sky, which provided just enough light for a couple of silhouette photos — enough for me to see her crouched down submissively (in case Mom should approach), and Dad standing over her and grooming her affectionately. It made me smile and heave a sigh of relief: she’s still accepted and loved by her father and even her twin brother. HOWEVER, I wonder if this relationship might be fueling some of Mom’s behavior toward this daughter — not unlike a triangle?? So yearling daughter is being forced to keep her distance during the daytime, and only feels secure enough to approach if Dad is there, or if Mom is not there. Let’s see where this leads. Stay tuned. The thing to keep in mind is that this is a normal coyote behavior and it’s done for a reason — it has its good side — it did for Rudolph! We all eventually leave home to make lives of our own, and Mom’s treatment of her is helping the process.